FOR-BID helps deter pets from eating feces. This easy-to-use powder is a highly-purified. crystalline edible protein fraction which, when mixed with food and fed to dogs, curbs coprophagy (consumption of feces). When eaten by your pet, FOR-BID goes through the gastrointestinal tract where the purified vegetable protein fraction and sodium glutamate are digested, ending up in the feces. This gives the feces a pungent taste when excreted, and discourages consumption by your pet. As the unpleasant flavor is experienced and the association to it is reinforced, the habit of consuming stool should cease. Be sure that your pet is not on steroid medications since this will counter the effect of FOR-BID. FOR-BID is used to curb coprophagia, which is a condition in which pets consume their own feces, or those of other animals. 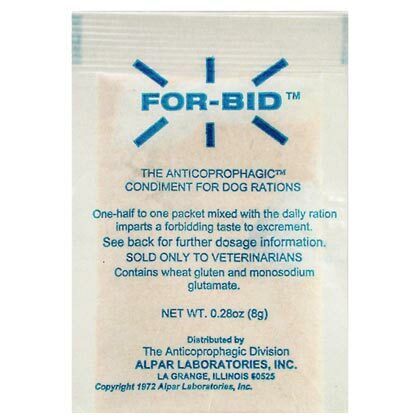 FOR-BID is for use in dogs, cats, and horses. Open package, sprinkle the proper dose onto food, and mix thoroughly. Cats should be fed 1/4 packet sprinkled onto food one time per day for 4 or 5 days. Give 1/4 packet two times per day (morning and night), for 5 days. Sprinkle the contents of packet on the dog food two times per day (morning and night), for 5-6 days. This will usually curb coprophagia for months, often permanently. 1 packet two times a day (in the morning and in the evening) for 2 or 3 days typically deters this behavior.